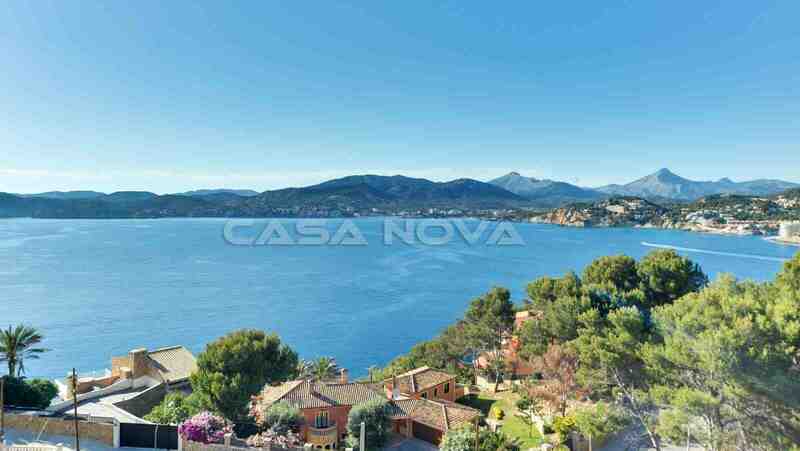 This luxury villa Mallorca in second sea line in Santa Ponsa impresses with fantastic sea views and many comfort. The property with best building quality is divided in two levels. On the ground floor are the spacious living-dining area with a new open-plan kitchen and one bedroom with its bathroom en suite. The upper level consists of 2 further bedrooms with bathroom en suite, a second living room with an open-plan kitchen. The basement offers a utility room and a garage for 2 vehicles. All rooms enjoy panoramic sea view. The infinity pool (saltwater) is heatable. Enjoy pure sunsets from your terraces.